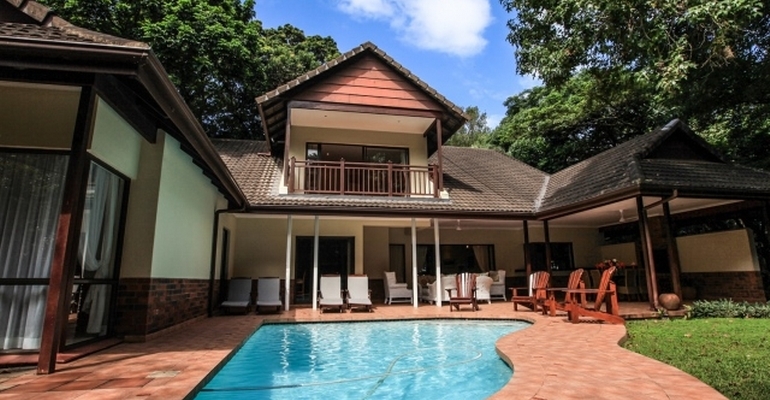 Marais Manor is a luxurious, spacious and comfortable 4 bedroom self-catering holiday villa in Selborne Golf Estate welcoming guests to relax and unwind in true holiday style. The front of the house has a large swimming pool set amid a manicured garden just off an undercover veranda furnished with padded outdoor lounge suite. The far end of the veranda has a large built-in barbeque / braai area for easy outdoor catering, with additional outdoor furniture making this a perfect setting for entertaining. The kitchen is fully equipped with modern appliances and a fridge / freezer with ice-maker, dishwasher, washing machine and tumble dryer. A spacious lounge is furnished with 8 seater lounge suite and large coffee table facing the TV with full DSTV and sound system. Leading off from the lounge is the Ladies Bar with 6 bar-stools, which can be pre-stocked for guests on prior arrangement. Marais Manor has 4 spacious en-suite bedrooms which are fully furnished including built-in cupboards, bedding and towels. Guests staying at Marais Manor are invited to make use of the fabulous facilities at Selborne Park Golf Estate. Aside from the immaculate 18 hole golf course there is also a swimming pool, tennis courts, children’s play area and a restaurant & bar where delicious meals can be enjoyed daily.